Autumn has worked its way down the slopes of the Appalachians and colored the leaves in the foothills of West Virginia, the place where I was born and where I now spend the six warm months each year. 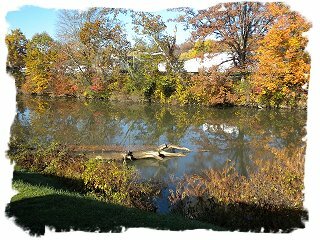 Looking down the bank outside my window into the slow drifting waters of the Buckhannon River I can see flotillas of gaily colored leaves making their way downstream to the place they will come to rest and slowly turn to soil. It's said that autumn is a time to reflect and I think that must be so, because I find I do most of my deep (deep being a relative word here) thinking about life in general and my life in particular during this time of year. A few days ago in such a state, I started pondering how the business of selling airplanes has changed in the last dozen years or so and about how completely my life has changed during the same period. The dot com crash was the beginning of what would turn out to be one of the biggest downturns in the aviation business since the post war bubble burst in 1947. The fallen dot coms were then followed by 9-11, the Wall Street debacle and then the recession, and our business was changed forever. Aircraft prices plummeted after twenty years of steady appreciation and the premise that if a dealer paid too much for an airplane, not to worry it would be worth it the next time the Blue Book came out, seemed almost laughable now. Dealers, including me, maybe especially me, rethought owning inventory and it was hard to know what to pay for an airplane. A 'no brainer' wholesale buy could turn out to be more than the aircraft would bring on the retail market. As a stocking dealer, I normally had (had being a euphemism for titled to me, owned by the bank) ten to fifteen airplanes in stock at any one time, and the noise of their munching on interest and insurance costs at three in the morning often interrupted my sleep during the downturn. As I slowly found new owners for these airplanes, I began to concentrate more on brokerage and I became a whole lot more particular about any aircraft that I bought. I substituted 'some brains required' for the 'no brainer' buys and as time went by, the aircraft that I marketed became more brokered than owned. Eventually it dawned on me that it was possible to sell brokered aircraft from anywhere, and that I was no longer tied to a desk at an airport. When you own aircraft inventory, there is forever something to be done and issues to be seen to and there is always an aircraft that has be taken somewhere for some reason. So just like the old time cowboy, you can't be far from where the herd is grazing. About the time I was exploring this new found freedom, other changes were also at work in my life. Whether it was an age or a stage I don't know, but I began to feel as if my possessions owned me instead of the way it should be, and as my enjoyment of them waned, then finally disappeared, I began to wish for a simpler life. Soon the wish became a yearning. I had so much 'stuff' it was controlling my life. No, more than that, it had become my life. For example one day I tried to count all the internal combustion engines that lived with me in the form of lawn equipment, generators, water pumps and chainsaws, and of course boats and vehicles. I quit counting at 23. I needed a full time mechanic. Also I still had Bodacious, the Cessna Skymaster that I'd used for airshow flying. 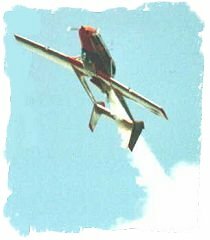 Even though I no longer did the shows the airplane still sat in the hangar, often not flown from annual to annual, for what can you do with an airplane painted like a calliope? I owned a huge house in which I pretty much used three rooms and often wasn't in the others for months at a time. I felt smothered and hamstrung and I decided to do something about it. And so I started selling my stuff. I sold the motorcycles, the boats and the wave runner; I sold my sport car, countless small combustion engine devices and I sold Bodacious to a buyer in Spain. The stuff I couldn't sell I gave away and what I couldn't give away I took to the dump. 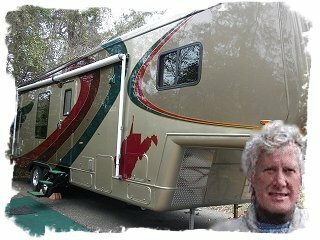 Finally in 2006 I sold my house and bought a beautiful 37 foot fifth wheel RV and a Ford one ton diesel to pull it. I found a perfect parking spot in the idyllic little West Virginia town where I started my first flying business over forty years ago and I happily began spending summers here, parked so close to the river that I could literally fish out my front door. I felt light and happy and as if I'd come home and a huge circle had been completed. I felt free. That fall I began what has become my annual regimen of six month in West Virginia and six months on the road that I continue to the present. Summer and fall is spent here in the cool and comfortable climate, and then when the trees give up their leaves in late October, I hook the Ford to the front of the RV and with my Yellow Lab Austin smiling over my shoulder, I hit the road for warmer climes. Looking back, I realize the stars had to be in perfect alignment for a life change of this magnitude. Not only did I become free to travel and was finally done with owning things, but at about the same time technology had developed to the point that I could work from anywhere. 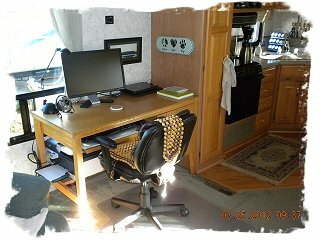 A cell phone and a wireless connection for the laptop and even a wireless fax made the office in the fifth wheel just as efficient as any brick and mortar edifice. As I write this, the geese on the river have been making their practice flights each day, their honking vees sweeping overhead as they prepare for migration. I feel a kinship with their instincts and I sometimes whisper to them that I'll be along shortly as well. This year as last, I plan to make my way as far west as I can go, to the stunning Morro Bay area of California, where the temperatures are as near perfect as anywhere I've found. Last year I went the northern route, by way of the Black Hills and Yellowstone and sort of dawdled along, seeing the sights and taking a whole month for the journey. When I'm traveling, I usually spend a half day in the office and a half day driving, putting around 200 miles or so behind us, more just drifting along than making serious travel. This year I plan to go by way of Texas, arriving in Austin in time for a family Thanksgiving gathering there, and where Lab Austin will be reunited with his litter mate Daisy, and then taking the southern route west to the coast. I find casting off on these trips to be a bit like the airshow flying that I did. I approach it with some trepidation, but once things start moving I become immersed in the moment and I get a huge enjoyment from it. I love the sight of the road unrolling beneath us and the adventure of finding what lies beyond our front bumper. I feel a connection with the eon old cycle of seasonal migration and privileged to have learned what the geese have known for millennia. I find it almost magical to have the comfort of always being at home while having the view out my living room window always changing. On the wall of my office is a sign that my daughter got for me when I first expressed my unhappiness with the clutter in my life. It reads "Simplify, Simplify, Simplify". The whole quote by Thoreau is; "Our life is frittered away by detail. Simplify, simplify, simplify! I say, let your affairs be as two or three, and not a hundred or a thousand; instead of a million count half a dozen, and keep your accounts on your thumb-nail." I consider it some of the best advice I ever took. Copyright © 1997 - 2012 Steve Weaver Aircraft Sales. Specifications are based upon owner's representations, and subject to buyer's verification. Aircraft are subject to prior sale or removal from market.